Folgen Sie der Fahne! Circa 1935, cast bronze sketch model for a proposed Third Reich monumental work, believed to be the creation of sculptor Hermann Scheurnstuhl. (1894-1982). 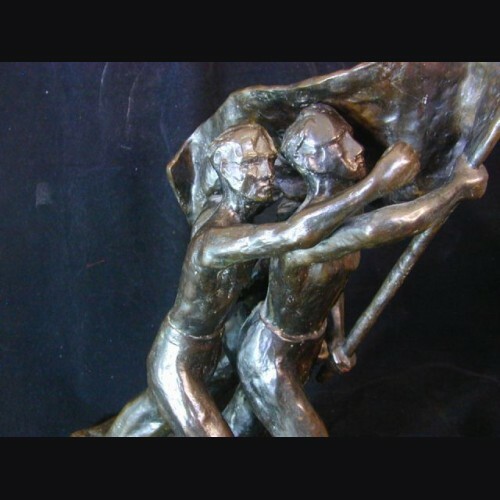 This impressive bronze group shows three figures, two men and one boy, shirtless, marching astride a large banner carried by one of the men. It measures 16" tall, and is beautifully sand cast with a dark brown/black patina. The model was cast by the prestigious Hermann Noack foundry, and is stamped H. Noack Berlin Friedenau. The artist monogram HS, is incised in the edge of the bronze base as well. It is rare for any Third Reich era bronze to survive today, as the need for copper as war materiel was paramount, and many works were collected and melted down during scrap metal drives throughout the war. Hermann Scheuernstuhl was a prominent artist who exhibited at the annual Haus der deutschen Kunst exhibition in Munich, and created a number of monumental works both before and after the war. One important work, installed in 1936 is a 4.5 meter bronze of a FackeltrÃ¤ger "Torch Bearer" in a Nazi salute and carrying the symbolic Olympic torch. This still stands today. A rare example, almost certainly unique.